Light. 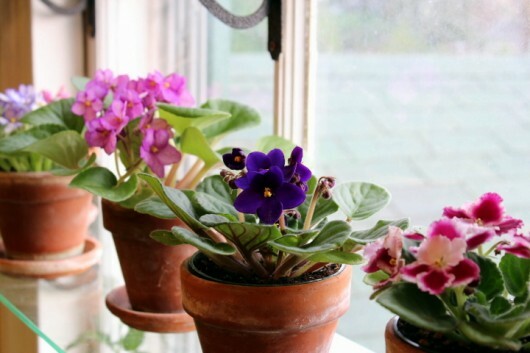 Make no mistake — African violets need plentiful light to bloom. As a rule, give them full sun in winter, and bright light in summer. From October through April, I grow them in the sunny east window of my upstairs bath (above). Then, from May through September, I let the plants dwell in a north exposure or under fluorescents. Otherwise, the harsh summer sun would surely fry their leaves. To keep the plants shapely, give the pots a quarter-turn every other day. For sensational bloom, place them under fluorescent lights. As you can see, I grow dozens of African violets beneath 48-inch fixtures that I attached to shelves in my Writing Room. These are not special “grow-lights”, but common, inexpensive “cool white” fluorescents. The plants are set 7-10 inches from the light (5 inches for miniatures and trailers), distances measured from the top of the plants. I leave the lights on for 16 hours each day, followed by 8 hours of darkness. Plants under lights need more food and water, but they always bloom to perfection there. Temperature & Humidity. You may have heard that African violets need indoor temperatures above 70 degrees in order to flower. Actually, this is not true. My own plants bloom and bloom in temperatures that range from 55-65 degrees. On bitter nights, I pull the plants away from windows, and return them only when the morning sun has warmed the glass. Saintpaulias will not bloom when humidity is low. They revel in about 50% relative humidity, which is fairly high for the average home in winter. Keep in mind that humidity plummets during the heating season. If you suffer from dry skin and a scratchy throat when the furnace is roaring, just imagine how miserable your African violets must be. To increase humidity, group plants together. Even better, set them on pebble-filled trays. Galvanized “boot trays” work well, and they can be painted to match your window trim. Keep the trays filled with water, but make sure the plants are resting on the pebbles, above the water-level. When plants are watered from the top, excess moisture drains down into the pebbles, and produces humid air as it evaporates. Pebble-filled bowls or oversize saucers (as above) are suitable alternatives to the trays. And here’s another tip: Grow your plants in clay pots. Clay absorbs moisture, and then releases it as humidity through evaporation. Watering. Use only room-temperature (or slightly warmer) water. You can water from the top or the bottom; sometimes bottom watering is easier because of spreading leaves. To water from below, fill a saucer or bowl with one inch of water, and let the plant absorb all of the moisture it can for exactly 30 minutes. Then pour off any excess. Water often enough to keep the soil moist, but not saturated. The weekly shower. To remove dust from leaves, and also to deter pests (including aphids and red spider), I shower my plants once a week with room-temperature or slightly warmer water. Afterwards, the plants are kept out of direct sun until their foliage has dried. Leaf spotting only occurs when the temperature of the water is colder than the temperature of the leaves. You can safely return plants to the fluorescent light garden even when leaves are wet. Fertilizing. 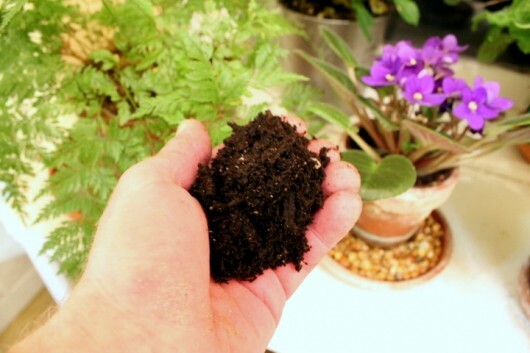 A low-nitrogen, high-phosphorous, soluble plant food is terrific for African violets. I fertilize every time I water, using Jack’s Classic 10-30-20 formula (click here to order from Amazon) . Window garden plants receive one 1/4 teaspoon to 1 gallon of warm water. I increase this to one 1/2 teaspoon food per gallon of water for the hard-working light garden residents. Soil. Use a light, humus-rich, well-draining potting mixture. Almost all commercial mixes intended for houseplants are suitable for African violets. Multiple Crowns & Suckers. With time, most African violets become burdened with multiple crowns and sideshoots, or “suckers.” These rob the parent plant of energy, and interfere with bloom. To free your plant of these offenders, follow the directions I described in this post. Pots. Mail-order plants always arrive in tiny, 2 1/4-inch plastic pots. You won’t need larger pots for months. The African violet in a too-big pot will be slow to bloom. I wait for six months to a year before shifting to 4-inch pots, and that’s that. I prefer clay pots — glazed or unglazed, but always with drainage holes — for display in the window garden. Then insert the stem, or petiole, in a 2- or 3-inch pot of damp soil. Lightly firm the soil. 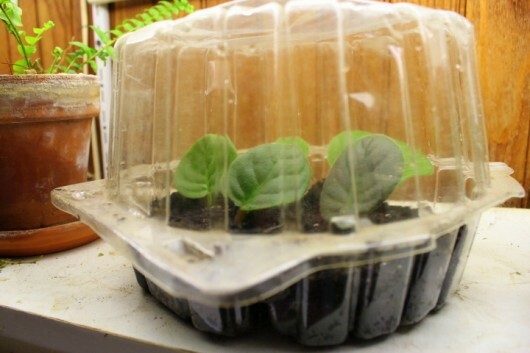 To produce a pleasantly-humid environment for the cutting, place the pot in a clear plastic bag. Then set the pot in a bright but sunless window, or, even better, beneath a fluorescent light. Fill the shallow bottom with soil, and then insert leaves about 2 inches apart from each other. Close the cover, and place the nursery in a bright window or beneath fluorescents. Neither the bagged pot nor the Boston-lettuce bin will require water until new plantlets emerge. After two to three months have passed, the leaves will give birth to numerous baby plants, as pictured above. One year, I had a single leaf sprout 9 new clones! Separate the tiny rosettes from the mother, and then pot them individually in 2- or 3-inch pots. Give them the same care I described earlier, and in six to nine months they will bloom as beautifully as the parent plant did. Of course, after propagating the leaves, you’ll end up with an entire forest of African violets. But who can complain about that? Do African violets bloom well for you? You can let me know by leaving a comment. As always, I love to hear from you. Thanks for this info, Kevin! I had a plant that someone gave me…I kept it alive and healthy for two years without a single bloom. 🙁 I got sick of trying and gave it to my neighbor. I just might have to try again now. Hi beetree – Glad you found some useful information here. Maybe your neighbor can snap off a leaf for you to propagate. Then you’ll soon have many, many African violets to play with! You are such an inspiration…..I am on it to make new violets. 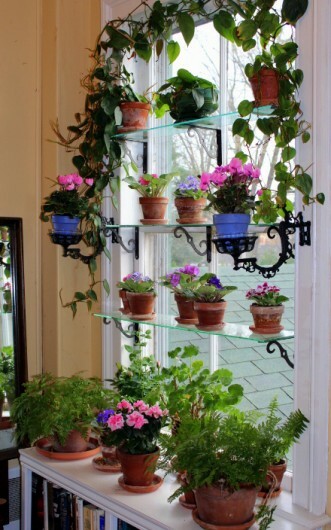 This winter one of my indoor projects is to turn a hallway window that is east facing into a window garden. I don’t know if it’s the best because during the summer it’s shaded by a maple tree, but in the winter it’s fairly sunny! But this is a beautiful guideline for african violets! I know I keep promising that I’ll do this one day… I need to make this year the year of the indoor garden! I will be triumphant! I have a violet that is healthy, green and beautiful….and no longer blooming, despite good light and fertilizer. It has also morphed into a trifoil, with only one stem appearing to have roots. It’s a pretty plant and the shape is nice but I miss the blooms! Any suggestions? Thanks! Hi Donna – Sounds like you have the perfect window for a garden — shady in summer, and sunny in winter. With glass shelves and a broad sill in place (I use a low bookcase as a sill), you can have all kinds of fun making horticultural portraits! constantine – By “trifoil,” do you mean the plant has produced little off-shoots, or suckers? Hi Kevin – by ‘trifoil’ I mean this: imagine three separate plants cojoined at the base, just above the soil. I would guess an offshoot would come from below the soil line, and these do not. Maybe I am mistaken. I think if I would cut two of the three off I would not be able to root them as the stem is pretty thick. Thanks for asking and I hope you have a suggestions! Cheers. Constantine – From what you’ve described, it sounds like your plant has multiple crowns. These interfere with flowering. I deal with them this way. I have an African Violet with beautiful pink leaves. It has never flowered. Are they only grown for their leaves or do they need an environment different from the green leaf variety? Its a beautiful plant. I almost killed it by forgetting to empty the water in the saucer its in. Have to root some leaves “today”. Hi Kevin, Thanks for those valuable tips for African violets. I’ve managed to get one of mine to flower again last year, and now I know why. I still have the plant and will give it the treatment you recommend, so that it’ll continue to flower! Thanks for sharing Kevin. 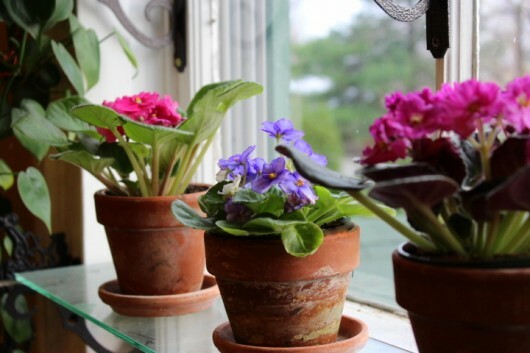 I have always loved my african violets and had extra wide window sills built into my east and southeast windows, just for them. Last week was plant dividing time and really enjoyed potting up new little pups. Ran out of room this year so not making any new plants from leaves. You are so right on using slightly warm water for the lovely plants they show their appreciation! I also use a fluffy makeup brush to clean up the leaves after potting and montly just to give them alittle dusting. Always enjoy seeing your plants, I am green and violet with envy. Kevin, you are always an inspiration. I can’t begin to duplicate your environmental conditions_we are still running the AC daily, but I am going to try-again-to grow an african violet. Thanks for the detailed directions. I never really thought much of them as I grew all kinds of other things my Dad, who worked in the greenhouses at Brookhaven Natl Labs, would bring me home. He could grow anything! Well, now that I am older (yikes!) and retired and live in NW Rocky Mountain Montana! I crave flowers! My summer is so short that by time your petunias start to look good they freeze! lol So I have started with 2 and am loving them. I always thought they were finicky plants and that is why old, gray haired ladies always had them! lol I am going to put glass shelves int he window and get some more colors and propagate! Thank you for the shove off the starting line to get going with them. Mine also surprising bloom pretty much all the time. 🙂 Thank you, thank you and I am going to make cognac cookies!! Have a wonderful holiday!! Thanks for the great tips on growing African Violets. I have one that I’ve had for YEARS (20+), that thrives on neglect. It always has flowers! The stem –if I could straighten it out is probably 6-12 inches long. It just spirals, and spirals. I need to transplant it, but i’ve been afraid to mess with “perfection”. What do you to to keep it from growing like that? Oh..and I stuck a broken leaf into the soil, and it has given me a baby! Hi Kevin – Thanks for the advice and nice detailed guide to dissecting my violet. This morning I got out the scalpel and went at it! The two crowns that looked less robust were cut off; each had a very tiny root system attached. I removed some lower petals, dusted all cuts with root hormone and repotted. The mother plant was also repotted. Several leaves were cleanly cut, dipped in hormone then placed in the lettuce container greenhouse as you suggested. Fingers crossed that I have success. This plant has a pretty flower:white with purple fringed edges and a coating of glitter over all. Thanks for the great guidance! I really enjoyed reading the article on violets and especially seeing the photos of your “family”. I have a bay window that faces pretty much east and my violets love it although I do have to curtain it in the summer so they don’t fry! I have about half a dozen plants that are all flowering profusely. Four of them are from leaves given to me by a friend. From these I was able to pass along three propagated plants to another friend while keeping four for myself of varying colors. The friend who gave the leaves to me cannot seem to get her original plants to flower so I am sending her a link to your site to help. However, I think it is probably the lack of light that inhibits her plants. One white violet that I have had for a long time was so very prolific that I think I re-potted around half a dozen suckers to give to a group of friends who adopted them. Now though I am moving soon and will not have that wonderful window and actually don’t have any that face east in the new house. Not sure what will happen to my colorful plants but I will have to find a way to keep them going ….. perhaps I will be able to find a way to put your lighting idea to work some where in the house until we can build a sun room on the back. Thanks so much for the direction for African Violets.. I have had 2 I got when my S/O’s mom passed on 7 years ago. I’ve split them a few times & they’ve always done wonderfully for me, but this year I almost lost all of them. I still have the 2 originals but none of the other survived. I have no clue what I did or didnt do, but my 3 orchids died as well. I think those plants all started to die after I brought a new orchid in the house.. No other plants died though I have a house full, none other are flowering types, they were the only ones affected. I keep thinking I should repot the African Violets and give them new pots as well as soil.. there are new babies so I’ll split them too. They are in a perfect for them window.. North in the winter and mostly shaded in the summer. I didnt know it was perfect for them, but as I said, until this year, they were happy. kevin, your violets are beautiful. Hi Apryl – In my experience, African violets with wildly-variegated leaves (such as your pink-leaved variety) tend to flower poorly — if at all. The reason: lack of chlorophyll. But the pink leaves are something to enjoy even without flowers! Hi Jerry Sealy – Good idea – use a make-up brush (or camel’s hair brush) to dust the leaves. I chuckled when you mentioned building extra-wide windowsills in your house. Oh, what we do for our plants. Bobbie Floyd – Do give AVs another try. They are soooo worth the effort! Cilla – Nice that you think of your Mom, Great Aunt and Grandmother when you survey your violets. I think of Margaret Jones, an elderly neighbor who gave me a leaf to propagate when I was 10 years old. Oh, the memories. Hi Cathy – Wow – a 20-year-old African violet! You may not want to tamper with the plant. But long necks can be cured this way: knock the plant from its pot; cut off at least half the roots, and remove all but the top set of leaves. Then replant, burying the long, naked “trunk” right up to the remaining leaves. And about the leaf which has given you a baby: don’t be alarmed, but it has given you many, many babies! Check carefully, and you’ll find at least 4 tiny rosettes of leaves. Best to pot these separately. Constantine – Glad that worked out for you. And it’s a good thing you like your purple-fringed, white-flowered AV. With all your propagation efforts, you will soon dozens and dozens of clones! Karen L. -African violets love to lounge and luxuriate beneath fluorescents. So if the windows in your new home are not suitable for plants…then by all means attach a fixture or two beneath your bank of kitchen cabinets. Then you can have blooming plants right on your counter top. Kim H – Hard to know what caused your AVs to falter. Like you said, it could have been a pest or disease that came in with your new orchid. Dorothy Hargis – I don’t sell leaves. But if you come to one of the tours here next summer, I’d gladly give you leaves! About showering the African violets. I have soft water everywhere in my house except the kitchen sink cold water. Will the salt in the softened water hurt the plants? I was given a violet as a gift and have had some for many years. This one blossomed for along time in my east window and i moved it to the south in the winter. we have wood heat. It started looking limp and stopped blossoming, so i repotted it in a supposedly african violet pot. one that you can water from the bottom and it absorbs the water through the upper pot. It just got limper and limper and finally i got rid of it. We have our own well and i have wondered if that can have an affect on plants? I used to have many violets and when i moved to this home brought my last one i had for many many years with. it was a double pink blossom. It had a trunk like a tree and reading your care ideas i realized i should have separated the off shoots but i thought it looked cool. Eventually i had to get rid of it also because it became limp. Hi Caren – Yes, softened water is harmful to African violets, and not just the leaves, but the roots, too. Any chance you can divert the water before it reaches your softening-unit? 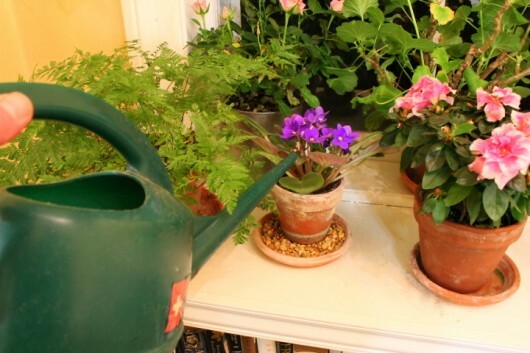 Linda K. – Those self-watering “African Violet Pots” can be death traps. I never use them. Too often, water is left is in the outer pot. This means oxygen can’t reach the plant’s roots. Consequently the plant drowns. And the first sign of drowning is — you guessed it — limp leaves. Well water should be fine, especially if you first pour it into a gallon-size jug. Let the jug sit overnight (or longer) so that potential gasses can evaporate. Then water your plants. Thanks for a very inspiring presentation on window gardens at the Sand Lake Garden Club on Wednesday night. Didn’t mean to put you on the spot about African geography. I lived in Africa for 6 years and still have a high interest. I looked up the Usumbara Mountains and they are in Tanzania. Kevin, thank you so much for this article on African Violets. I have loved them and grown them for years. They remind me of my maternal grandmother whom I had a very close nurturing relationship with. She always grew them and I am absolutely in love with them. I can’t resist rooting a leaf if it breaks off, but my space is limited and I recently have been trying to control myself! But they are just so, so beautiful and varied when they bloom. I have definitely learned some things from your writing about them and loved looking at your photos. Question: I have always rooted mine in water and then transferred to a pot. Is this not a good idea? I guess it’s not really necessary since propagating directly in soil works so well for you. One more question: Some of my older, larger plants have outer leaves which have very long stems and rest on the pot rims, then seem to droop and die. Do you have this problem? Any ideas for a remedy? Well, that’s all for now. Keep up the fascinating life you lead! Becky – Yes, Tanzania. Glad that’s settled! Naomi Shelton – Petiole rot is a common problem with stems that rest against the rim of a pot. If you use clay pots, as I do, it helps to dip the rim of the pot in melted paraffin. Paraffin not only keeps the rim dry, but provides cushioning for the stems. A ring of aluminum foil along the rim works, too, whether the pot is clay or plastic. I have had similar problems as KimH: After a few years my AVs seem to whither and die. I am fairly sure the cause is a build-up of salts in the soil from fertilizer and calcium in the water. My solution is to flush out the soil by slowly running water though the pot for several hours. After a week or so, my AVs will perk up and blossom again. My violets have not bloomed in a long time. They are in light,I water and fertilize. What am I doing wrong and what can I do to get blooms? my violets don’t look healthy at all, and I’ve debated tossing them, which seems so harsh. After reading your instructions, I feel that they have a chance to flourish and am looking forward to implementing them. Thanks so much! Kevin I have my mother plant in a self watering African Violet pot. It is upstairs in a south facing window with bright light and has been doing fine. I went to my other home for 9 days and watered it when I came back as it was dry to the touch but within a day the leaves fell down but flower stems still standing tall. Outer leaves are rotting off. What did I do wrong? Too much water? And are those self watering pots really good for African Violets? I love your violets…never quite thought of them in quite that way though…it will probably be a line forever in my mind now. Beautiful! I use to have a window full until I moved down South. Now I’m home again I’m going to work on sprucing up my window area. thank u for the information.. i do hav some african violets in my balcony, there is plenty of bright light, but no direct sun.. hope they ll bloom as beautiful as yors..!!! Kevin – thanks for the info. I already have a couple African violets but you have inspired me to get more! By any chance, do you have a favorite source for plants? I would love to be able to find some plants which are specific cultivars rather than just the typical no-name varieties found at my local garden center. 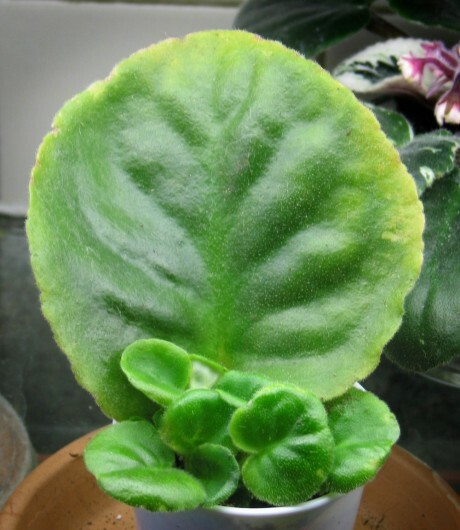 Jokha – Probably your African violets have produced suckers. You can remove these off-shoots and create new plants this way. Abby – My favorite mail-order source for named varieties of African violets is Lyndon Lyon Greenhouses. Paul Serano, who owns the business, is a world-class hybridizer. I visited the greenhouses one frigid January day, and thought I’d stepped into the Garden of Eden. Amazing! I enjoyed this post. I have one violet, inherited from my grandmother ten years ago (no idea how long she’d had the plant) that is an absolute powerhouse! It is in nearly perpetual bloom, and it produces new side plants regularly. I separate the plant every two years, and share the babies with friends. I was glad to read that you put plants in a north window. That’s where mine live, and they do great. People react almost violently when I tell them that! I have other violets as well, which do not thrive as well as my grandmother’s. Some have leaves which have curled under, and I wonder if they are more sensitive to the cold temperature I keep the room. I’ll try to be more careful about using warmer water for them. My grandmother’s violet, in the same room and conditions, does not have curled under leaves. I enjoyed your post and lovely pictures! Thanks for the info about Lyndon Lyon. The only problem is that now I have to CHOOSE which cultivars I am going to order and, given my plant obsession, I will probably order more than I should. I have already propagated lots of Begonias and it looks like they have to make room for some neighbors. If you hear about a woman who has been swallowed up by her plants, you will know whom they are talking about! I was given an African Violet for Easter last year and it was beautiful. Now the leaves are great but it hasn’t bloomed since last year. By the sounds of everything here I’ve read here I may be overwatering it. It is stil in the original 4″pot that has drainage. The pot is in a bowl that I’ve been putting about 2 inches of water in every week and just leave it. Actually I just did that this morning and noticed the soil is saturated and the bowl still has water in it. If I allow the soil to dry out and begin watering as suggested above will the plant bloom again? Hi Patricia – Yes. If you keep the soil moist but not saturated, and if you follow all other cultural directions described above, your African violet will most definitely bloom again. I purchased 1 violet last fall & it was blooming, but it has NOT bloomed again. I heard once that violets need companions. Is this true? Also are there male & female violets & do you need one of each? Kevin, I have read all blogs about not blooming African violets, I purchased one in March 2013 with plastic container , blooming, then of, now of course blooming has stopped, I water underneath,bottom, and every now and then I have a 5cc syringe to water the top to remove white desidue top of soil, I named her Lucy, I did see one sprout looking like about to bloom go in to the light and I was excitied ,but wittherd and died. Lucy is a beautiful Plant under whats called an Intellegent Light(fluorescent), I keep her in my bedroom….I have researched and researched I would be SOOOO HAPPY if a single bloom would appear, should I just be patient? dunno why that new stem abut to try to bloom died, huge beautiful leaves , beautiful crown , no suckers…no matter what happens she will live with me I just want her to bloom…. Hi Conrad Horst Jr – It sounds like you are doing everything right. However, you did not mention food. Try feeding Lucy a high-phosphorous formula (sold as “blossom booster”). I feed my violets with every watering. Plants under lights receive 1/2 teaspoon formula dissolved in one gallon of room-temperature (or slightly-warmer) water. Thank you so much for this page! I have an African violet from my mother’s funeral that is not doing well, though I’ve given it indirect light and kept the leaves from getting wet (my sole knowledge of African violets before now). I have a lot of info on them now; again, thank you so much for your helpful page. Years ago, I found what worked best for me is that I plant my AVs with a couple of inches of athletic shoe shoe string up into the dirt from the base of the clay pot hanging out the hole at the bottom with several inches of string extending down into a watering area. 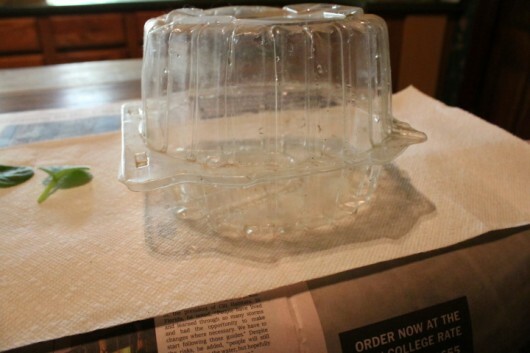 The watering area is always separate from the pot and below it, for example a small plastic margarine tub with a hole cut in the top and the string going through its hole, or a gravel-filled dish. Then the watering area is always kept full of fertilized water (I also like 10 30 20) which wicks up into the pot soil through the shoe string, keeping the soil constantly moist without ever directly watering it. I just make sure that the watering area constantly has enough water. Then I put the margarine tub or gravel dish inside a basket or larger pot with the clay pot with violet sitting on top. My secret is hidden and the plants flower bountifully! And I’ve found Northern windows work well for constant indirect light. Suz – Nice to meet you. So glad you found this information helpful. Hi Suzanne – Wick-watering (which is what you described) is wonderful. Love that you keep your reservoir hidden for the purpose of display. Diane – No need to shift to a larger pot until the diameter of the plant’s leaves exceed 3 times the diameter of the pot. Thanks for all the pictures and wonderful information. I snapped a couple of African violet leaves off as I was repotting the plant. I put RO water in small styrofoam cups, covered the top of the cup with plastic food wrap, put a pencil hole through the wrap, put each leaf in its own cup, and set them under my fluorescent lights. I watched the leaves for a couple of months, both getting many roots; I added a tiny bit of fertilizer as I replenished the water as it slowly evaporated. As I got busier and busier, I forgot to pot them. Imagine my surprise when each leaf grew a plant; still not having the time to repot, I left them in the cups. I was thrilled when each clone bloomed!! One of the fun trends now that I have noticed is growing Tillandsias in hanging glass shapes. I found an egg-shaped glass and now have an African violet in it with the depth of the glass just deep enough to hold water and roots of the violet. It too is blooming. I love experimenting with growing plants. Kevin, I’m curious as to whether (or how often) you exchange the old soil in the pots for fresh soil. I have a couple of violets that have been in the same 4″ pots for 3.5 years. I do feed them but have begun to wonder whether it might be a good idea to refresh the soil and I’d be interested in your thoughts. Kevin, you got me on the road to African Violet heaven! I got teased constantly about saving the plastic containers in which fruit and lettuce come, but they are perfect for propagating violets! I have never had such luck! I thought that the leaves would rot, but they didn’t, and I have baby plants peaking up everywhere! Thanks so much for the great tips! Plants are expensive and this makes it possible for me to have as many as I want! Keep giving us the fantastic ideas! My violet is in a plastic pot with no drainage hole. Its not doing so well and is looking a bit wilted. Do you think I should swap it into a different pot? Also what causes the leaves to get yellow spots? I had that problem a little while back, I though it was maybe too much sun (I’m in Australia). Your plants look amazing by the way! Hi Kevin. very interesting and informative article. here’s my problem. both of my pretty good size african violets also bloomed constantly. one in purple, the other in pink. (2 are enough for me). I have had them long enough to have needed repotting 3 times. 2 years ago i moved into a new home. my pink one hasn’t bloomed since and i have done nothing different…help? thanks. I have an XTC violet, that is pink with purple splotches. I propogated one, and the bloom came out just purple. A year later, I propogated another leaf, and just a pink bloom with no purple. So do you have any idea how this is happening? The mother is healthy but many years old, and has had many babies that were the correct bloom. I have an African Violet that had blooms and rebloomed then earlier this year then the blooms died off and I was hoping once the.spring I’d see some blossoms. I got new leaves but they stayed small in the middle and no.blooms. I’m.wondering why? I’ll have to try to propagate like you showed in a plastic bag. I’ve referred back to this page several times on caring for my african violets. I brought two AVs with me to university in the fall and they did not like the dorm very much and stopped blooming and got yellow patches on their leaves. since moving from my dorm the leaves have been looking fantastic and there is always new leaf growth but never any flowers anymore. they seem to get plenty of light. i have started to try schultz african violet fertilizer. do you have any other recommendations? thank you!! Thanks for all the good tips. In the midst of moving preparations I accidentally let my lovely African Violet get too dry and the flowers died. The leaves are still healthy looking. I did not remove all the dried up flowers…unsure if they were needed to allow for further blooming. Should I pull them off or not? Once they have died, can they come back with the care and treatment you describe? 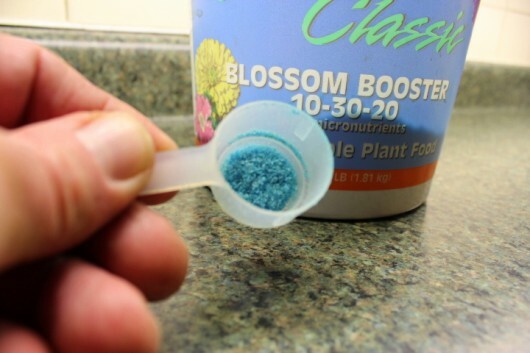 Hi Marie – I’d try a different food, such as Jack’s Classic Blossom Booster. Hi Alicia – Pinch off the spent blooms, provide food and water and the other cultural conditions described above, and you’ll have blooms in very short order. I bought my violets at the grocery store for $1 each! At the time, they were in blooms and quite beautiful. Now–over a year later–no more blooms but the leaves still look fantastic! I’m so happy to find this advice and can’t wait to try everything. Is it recommended to plant more than one plant in one pot? Hi Kristy – One plant per pot is best. Otherwise, leaves will create too much shade and bloom will suffer. Have fun with your violets! a miniature African Violet. Of course I couldn’t leave it there. The last time I saw one was at the New England Flower Show in Boston. It’s in a pot with no drainage so I will propagate some leaves just in case. I confess to causing crown rot in one of my older plants. Took a chance a peeled all the rot off and stuck the little bit of healthy crown into the soil. It lived and has a flower. Doesn’t hurt to try. Dear Kevin, love your newsletter. Do you have any info regarding streptocarpus? 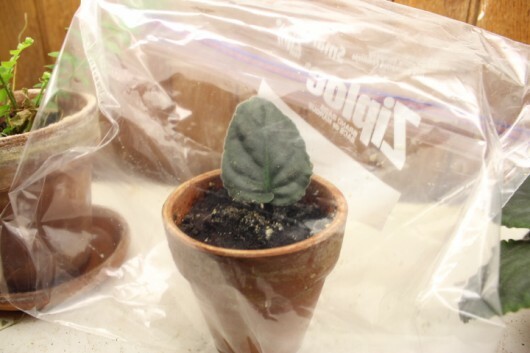 Their care is quite different from that of their cousins, African Violets, isn’t it… Any hints you can share about propagation would be appreciated! Kevin, your directions were doable instead of daunting, and because of them I now have 6 (had 7,gave one away) beautiful African Violets from one plant. After dividing, they spent time under a fluorescent light fixture in the basement until they were blooming beautifully. I have now placed those beauties on my Victorian violet stand and divided two more, plus replanted one that had a stretched neck. I am looking forward to having a “stable” of blooming violets to rotate onto the violet stand following their spa vacations in the basement! Heck, I may need to find ANOTHER stand! Thank you for your great information! I had been mistakenly keeping my violets away from all windows because I was towould be too much light. But my 2 violets hadn’t bloomed for yrs. The ONE I had from my grandma who had passed away, had not bloomed in so long I couldn’t even remember what color the blooms had been! And I couldn’t get rid of it of course because of the sentimental value. But thanks to you it’s blooming almost continuously! And the blooms are extra special to me, because of my grandma of course, but also because theyare different from all the other violets I have now, and from any of the ones I see in the stores. They’re a single petal bloom that’s a very pale pink which really shows of the sparkling or shimmer quality violets have. Anyway I just wanted to say thank you. I never would’ve gotten it, or any of them to bloom if it weren’t for you. And I just came back to re-read this totoday ecause I picked up a pink & green variegated leaf violet, but it hasn’t bloomed for me yet. And again thanks to you,I noticed it has 2 centers. So now I know it needs to be split. I’m getting ready to follow your directions on that now. Thanks for all your help! I have a mini AV given to me as a gift with lots of blooms. After the flowers died off it bloomed again once, but I didn’t pinch off the dead flowers since I didn’t know any better then. Now it has plenty of healthy green leaves but no blooms for about 9 months. It’s in a bay window facing northeast. I water regularly once a week or when soil is dry, and fertilze with Miracle Gro AV food (7-7-7). I even cut off some of the older leaves in hope of diverting nutrients to incite bloom, but to no avail, of course. New leaves are sprouting yet no bloom. It does not have any sucker plants. What else can I do? Hi Little D – Miniature AVs need even more light than standard varieties. Try moving the plant to brighter spot, if possible, or place it beneath fluorescents. Also, better to use a plant food which is high in phosphorous. 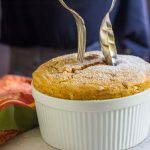 You might like to use the same food I use (it’s mentioned in the article above), or something similar. Look for a high middle number. I have three AV in one long tray I noticed one is kinda growing above or pushing up from the soil I see the roots what is going on and how do I “fix” it? Also how can I tell if my AV needs divided or separated? I have one large AV with variegated leaves in the center and the outer leaves are pure green. I need your help. I read your advice and was very happy with what you teach. I noticed that you use a fertilizer much higher than mine and am wondering if that’s the cause of my violets not blooming as terrifically as yours. I have been using Dyna-Gro, liquid Bloom, plant food – 3-12-6. Your fertilizer is 10-30-20. Do you think I should change to your kind? Love my African violets! My grandmother, mom and I all have the knack for growing some beauties. Yet my sister and mother in law have no luck at all. Your info was great and i will try a few ideas I picked up on! After killing all my orchids, I tried African violets…and WOW. I must have the perfect place. SoI bought 25 leaves on the ebay. She sent doubles and only 3 died. It has been 9 weeks and I have babies all over. I thought I’d better get a video of how to transplant to these self watering containers I bought. Thanks for the video. Mine look like yours. When do I chop off the mother leaf? Mine are still doing well and green. This is a porch I have enclosed with windows on the north and east. They get a direct blast of sun for a short time in the morning. I have insulated it under the floor so it should be ok. The older plants have constant bloom. Thanks for the inspiration. Can you tell me the name (variety) of your white and burgundy african violet in the last picture just before the Comments section? It’s beautiful and I would like to find one for my collection. I have many leaves on my plant, but no blooms. It is in a room with Orchids that are thriving and lots of light. I am wondering if it is my container. It is called an African Violet pot like they had years ago. Glazed pottery on the outside and pourus on the inside. The florist tag said to keep the plant moist and that pot seems to do that, but according to what I read in your information I think it might be getting too wet. Will appreciate your answer. Thank you for the instructions. I followed your suggestions and started a dozen plants. Cant wait to do it again, thinking I might need to snag a leaf or two from a friends (love to have a variety). Have you ever tried to combine leaves to get a different variety? hi, kevin, do you ever grow miniature violets? I’ve had limited success and several failures. They don’t seem to want to bloom often and the ones with leaves closer to the soil die off. I’m trying to keep glass pebbles on the soil for those. Hi Reeni – Miniatures demand more light than standard varieties. They bloom best when placed 2 inches beneath fluorescent lights. I have 6 plants in 4in pots that are old and flower beautifully. I would like to transplant them in 5 in pots but I can’t find clay pots. Can you help? Hi Kevin, I just may have a new tidbit for you pertaining to African Violets! Each time you water, add 2 teaspoons of Hydrogen Peroxide to the water, you will be AMAZED in about seven weeks to see how many flowers you will have on your plants! I have shared this tip with many Garden Club ladies, and I get many letters telling me how fantastic their plants are now! Kevin, I have a tip for you that will encourage more flowers than you have ever seen on your African Violets. When you water, add a couple teaspoons of Hydrogen Peroxide to the water. Seven weeks later you will be amazed. The leaves will be full and plentiful too. Hello..I have several violets..but my husband dropped one of my favorites..all I have is the whole crown plant with about an inch and half stub..can it be saved? Right now, I have it stuck in moist dirt..but, not sure of the outcome..help! Thanks! Hi Rose – Your damaged plant will probably recover. To hasten new growth, increase humidity around the plant. And as insurance, I’d take some of the broken leaves and propagate them to make new plants. I’m new to African violets having received one as a gift. I’ve had it for approximately 3 years. I thought it had outgrown its pot & transplanted it to a larger pots. Since that time, the outer leaves have become limp & are dying off. What can I do to help it survive? Hi Kathy – The stems, or “petioles” of the outer leaves can rot if they are resting against the rim of the pot. To rejuvenate, snap off the damaged leaves, and then shift the plant to a smaller pot. Trim some of the roots, if necessary, to accommodate the smaller container. And be sure to bury the “neck” of the plant deep enough so that only the stems of leaves are exposed. Hope this was helpful to you. Well it seems that someone has had a small success or at least success as far as they can tell. African violets do need light but it also depends on if the tubes are new, or if they’re T12s, T8s or T5s. Also I grow large standard African Violets for show. It is not uncommon for plant to be 18 to 26 inches across. Leaves are as big as 5 to 7 inches not including the petiole(stem of leaf). Violets have fine fibrous roots and need a light porous soil. We call these soiless mixes. A combination of peat and perlite. Many show growers use ProMix BX and then mix it 2 parts ProMix Bx to 1 part perlite. Plastic pots are used to maintain and evenly moist mix. Show plants are kept disbudded for months while the foliage is allowed to grow. About 8 weeks before the show we induce budding. 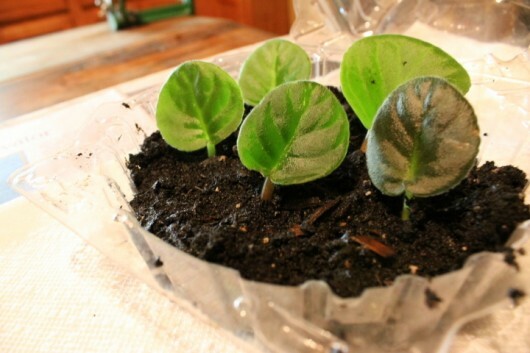 Want to know how to really grow an African Violet? Check out the African Violet Societ of America (AVSA). http://www.avsa.org. Find a local club and join. Clubs love getting new people who want to learn how to grow African Violets. Please check it out and don’t believe every thing you read online. Do a search for African Violet Show Plants and see what you find. You will see what a really good African Violet. Watch out for those clay pots. They dry out fast and harbor disease. Find a club in your area that is having a show and go. You will see what they are suppose to look like. Westland — I’ve grown African violets for nearly 40 years, and, like you, was an active member of AVSA. Perhaps you’ve read some of the articles I wrote for African Violet Magazine (the AVSA presented me with an award for one such article in 2009). These days, I grow Saintpaulia exclusively for pleasure — not for show. I can’t tell you how much fun it is to enjoy the constant parade of flowers without going through the extremes of disbudding, etc., in hopes of winning a blue ribbon. And as for pots, I’ve used both clay and plastic over the years. Based on my own experience — not endlessly repeated hearsay — I’ve discovered that both types are acceptable for the best little houseplant in the world. As for myself, I am new to the AV world… I recently rescued 2 AVs from the clearance rack @ Lowes in the dead of a Louisiana winter… 🙂 They are currently in ceramic s/w pots, and are still alive for now…. I recently bought an Oyama pot and a MoistRite pot to try… I also may try a clay pot…. hi i loved your ideas but I have a violet we have had for years and it has always done good but now the leaves are just limp and I’ve tried everything I can think of except transplanting it to bigger pot got any ideas? The African Violet Society of America http://WWW.AVSA.org has s very helpful page called Violets 101. You’ll find some great tips there for how to repot an older violet. With regular repotting they can live 50 years! I have a question about lighting. I have cool whites like your setup. My African violets are not thriving however and I’ve had to cut them back quite a bit by removing dead leaves. Many are like babies (only a few inches across). Should these be treated like minatures for lighting purposes ? FWIW, I think they may be failing because I’ve been using tap water which contains chloramine in my area. Hi Susan – If all other cultural conditions are satisfactory (sufficient humidity, not-too-large pots, etc.) then yes, move the plants closer to the lights. And if there’s any chance your cool white tubes are old, definitely replace them. You’d be amazed at how plants respond to fresh fluorescent tubes! Kevin- So glad to have found your site. I had a friend who became a member of ASAV with a local chapter and there’s no way I’d follow some of her ideas- like sitting pots on top of plastic water containers with long wicks, to me, look hideous. I love your laid back way of growing AV’s. And like you I’ve previously had wonderful luck for many years. My problem is- usually my small garden of AV’s (in an east facing bay window) are all in bloom every winter here in New England. This year I got nothing, except one large one that my sister sent me a few months ago. That gorgeous thing won’t stop blooming! I’ve even lost a couple I’ve have for a few years. I can’t seem to see any evidence of bug infestation, and I’d spray them if my husband hadn’t used the last of my bug spray, and I was able to find some more. The temps have been colder than ever before so I keep telling myself that that is the problem. I do have a plant light mounted in this window that I turn on faithfully every afternoon and shut off when I go to bed (late). Any ideas on why all this is happening- no blooms and failing plants? PS- You might want to delete #84 I think it’s an ad. I just discovered your site and I love it. The window with glass shelves are just lovely! I overlooked a 2nd crown growing (and discovered 1 sucker) so I separated them yesterday following your instructions. I always heard not to get the leaves wet, use a brush to clean the leaves, etc but tried the shower according to your instructions. They look awesome and so happy (grateful too) today. Thanks for sharing your knowledge and great photos. Hi Kevin, Our city water has ph 8.5-9.0 alkaline with little chlorine. I fill containers and let sit for 2-3 days, then I have been adding 18 drops of vinegar to make the ph 6.6-6.8, and add 1/2 tsp. per gallon of Optimara 14-12-14 fertilizer. My violets are looking good and have many flowers, but is this the appropriate way to water. I’m fairly new at growing AV’s. Please help! Lots of great information. Could you tell me what I am doing wrong. the leaves of my plantsare very compact. They do not reach up tall like I thought they should. The shower you talk about also. Do you mist the plants with water? And how does that get rid of the dust? I have read many site on African Violets, but I really like yours. IT gives off a vibe that tells me you really know what you are doing. Thanks! I wanted to share my story quickly. I had a few african violets for about 5 years after rescuing them from the building’s laundry room. They bloomed a few flowers here and there, but I didn’t think much of it as they were still healthy and beautiful, and the ones my mom had growing up never bloomed either. I thought that perhaps they don’t all bloom, or don’t do so very often. Well, after a friend of mine came over and told me that such healthy plants should be in bloom year round, I was excited! So I did some research (before I fund your site) and did a few alterations. I already used liquid African violet fertilizer every time I watered, but added a pinch of epsom salts to it back in january, started watering from the bottom, and put them directly in the south east window sill. (my only window) Within a few weeks I could see little bumps forming near the roots on one plant. Within a month it was in full bloom. And I mean FULL! This one has 3 individual plants in one pot and each one bloomed, but one of them had more flowers than leaves (and they were quite dense in leaves, even though I keep thinning them out). It wasn’t long before the other two followed and are growing flowers like crazy. The funny thing is that they are completely different from the ones they produced before! More colorful, vibrant, and larger. One went from producing dull white flowers, to soft pink ones. They are getting too big for their pots now but as long as they are happy, I will leave them alone! I think I will get a few more! My new favorite plant! I have a purple African violet that is 45 years old. It is my baby and I love the way it just keeps blooming and blooming and blooming. I like to feed it just African violet food. I do have to separate it every once in a while so that I get more than one plant but the mother plant is actually 45 years old. It was a gift from one of my college friends when I was first married. Every time I stop and think how old it is I am very surprised. Since I’ve moved to Florida it likes it here much better than Connecticut. Wishing you all lots of success with your plants. I have an AV that’s over two years old. I have repotted it several times, merely moving into bigger pots without cutting any shoots off. It is now in an 8″ pot, and has a 15″ span and 8″ height. I read that AVs should only be kept in 4″ pots. I guess I will need to perform surgery, but am very nervous. Did I mention that I am not a plant person? I honestly ignore it and water from the bottom —- and it is in near constant bloom! I’m afraid that I will kill it if I try to help it. Any insight would be appreciated! I had a Violet for over 11 years she died about 4 months ago I could not saved her. I wonder if there is a way I can bring her back, I have not town away the pot, I was wondering if there could be a seed or something I can use to bring her back. I got attached to her. Thanks for the great info! I had to repot my violet because of its trunk being too long. How long do I need to keep my violet in the plastic bag? Thanks Kevin for your beautiful post of ” African violet” your information is very clear and easy to understand. I really enjoy reading your post. I bought an African violet about 6 months ago and it came in a small plastic container, and I have not been re-ported since, Most importantly I have been waiting for it to flower but it seems to keep producing healthy leaves. I left my African violet in my bed room. there is plenty of light and I only water it and didn’t know what fertilizer to use. After reading your post, I know what type of fertilizer to use so thank you for that, however, could you please advise me on anything else i need to use or add. Thanks mate. It was really awesome. After reading about African Violets on your blog, I have been inspired to start growing my first plant. I recall my mother having some that she loved. I got a clay pot, tray with stones, waxed the edge of the pot and am watering and fertilizing as you suggest. My flowers are terrific and continual. However the leaves seem pale. They aren’t spotty, but have an overall insipid pale color. Is it that the sun is too direct? It’s on a south facing windowsill in Los Angeles where it gets angled sun all day long. African violets are new for me, I have 3 and am going out of town for a month, how can I keep the alive? I have no one to care for them. How much deeper my pot should be to let the African Violet bloom happily? My plant’s foliage is about 7.5 inches now and its not blooming at all. I am giving enough sunlight humidity and water to it. I am not sure what I am missing. But I kept it in a 2.5 inch deep pot. Is this a reason? Sudheshna – You mentioned light and humidity — but not fertilizer. Try feeding your plant with a high-phosphorous formula, such as NPK 10-30-20, as mentioned in the article above. Otherwise, your violet seems happy in where it is. As a rule, only shift to larger quarters when the diameter of the leaves (measuring leaf-tip to leaf-tip) exceeds 3X the diameter of the pot. Good luck with your violet! I am writing to you because I asked Google to take me to a website exclusively for self-watering African Violet pots. But as you can see, there is not ONE word on your website having to do with self-watering pots. I get so tired of Google leading me astray. Why do they do it? And why do you let them? Thank you so much for this guide! I have since reading this over a year ago taken on several violets. I have been able to talk to people in my community into giving me a leaf of their healthy plant and created several wonderful starts. I used to be afraid that I could only grow spider plants and other such common houseplants. I have now a reputation for having “a way with plants” I love that people entrust me to help bring their plants back to life. My local grocery store hasn’t been getting the lettuce that provides such a great nursery, however I found a great apple container that holds each apple in a almost plastic bubble. I now use this for my violet starts. I never would have seen the possibility to use this container without reading your advice. Thank you for providing such great (picture based) advice. I truly appreciate it! No flowers my violet in 2 yrs? Great info. I caught the bug two years ago and purchased a bunch of leaves from different sellers on ebay. All were colorfully flowered variations, and of leaves. They grew like maniacs and are all healthy in one big pot- and it blooms regularly in the winter and summer but only WHITE flowers on all of them….Was I scammed by all of these different sellers? or what> Did I do something wrong? I found what looks like part of a stem growing out of one of the flowers. Never seen such a thing. My 2- yr old African violet gets afternoon sun through louvered shutters, and it sits on a table where I have a small lamp on 24/7. I water it once a week, and have very healthy leaves, but I never get blooms. Any advice? …I was thinking about your African violets. Reflecting, more or less really. When I was a teenager (I’m 50 now :-() My mother was a member of the Kansas City African violet society. We grew hundreds of these plants in our basement under fluorescent lights. The club had its own show and she received many rosettes, blue ribbons for her plants. We also had a booth at the lawn and garden show in the spring. I grew them when I graduated from college and entered my plants in the category, window grown. I won, I wish I can remember the name of the blossom/plant, best grown. That plant was the size of a pizza pan, with no suckers and I’m not exaggerating, over 200 blossoms. It was a pink, ruffled variety. We also traveled to Pennsylvania to attend an African violet show, our president was a lady by the name of Sue Hill. I know it’s a long shot, but does that name ring a bell with you at all? Probably not, but sometimes it’s a small world. My mom passed away, looking at your violets brought me back…thanks for that, I haven’t grown many violets since then. I have noticed insects around one of my african violets. What should I do? Hi Kevin, I received a basket of 3 African violets surrounded by ivy. They were all potted individually. The minute I brought it home, the blossoms started wilting. Later I watered the plants from below and let them drain off for quite awhile so they weren’t standing in water. I don’t know what I could have possibly done for these to wilt. What should you do with to many suckers? (besides sell them) I am in dire need of help and id don’t want tons of african violets in my house. HELP!!! I’ve successfully grown African violets for year. But 1 1/2 years ago my Mom passed away. In her casket spray we had 2 violets added. My brother and I each got a plant. He had never grown a violet. His blooms almost consistently and I have yet to have a bloom. What do I need to do? He loves sending me pictures of all his blooms, knowing mine is barren. Hi Kevin. Your site is very bright, very easy to follow and makes it sound easy to do. I have 2 African Violets, a pink one and a purple one. The purple one does not bloom and I managed to kill the one I had previously. I am going to follow the instructions I read on your site and will let you know if it worked. Thank you so much for a great site. Hi Kevin, just loved your site and the plants look so healthy and vibrant. I am a nubie but I have a question. One of my violets started life as a green plant but now it is variegated. Can you tell me what I am doing wrong? I also not that a leaf from the variegated plant was green and now it too is becoming variegated. I just stumbled onto your site while looking for help with my African Violet starts. Imagine my excitement when I found great recipes also! I LOVE this site! The info on the plants is the most concise I have found and the pictures tickled me to no end. I am a visual learner and these pics are like best friends for me. Thank you, thank you, thank you! I love my violets but I cannot get 2 of my trailers to bloom at all, it was 3 but after6 months one has decided to start a bloom the other two? nothing, Plenty of leaves, thinned them out ,placed them in different windows, they are miniature and growing good ,very crowded lots of tight leaves but never bloomed or show signs of blooming,,,HELP!!!!!! Hi Kevin, I enjoyed reading all your tips and questions by readers. I love violets and have many different varieties of full-size and miniatures. I fertilize with every watering, and some of my violets bloom almost all the time. Others rarely or never bloom. If I am treating them the same, and they are all in the same (southern exposure) light, why don’t the others bloom? I have no windows in the east, but the place I have them gets good sunlight most of the am and into the mid-afternoon. Thanks!! Hello! I’m hoping you can give me some advice. This summer I went to an African Violet show with my grandmother and she bought me one of my very own. I’m afraid I don’t really know how to take care of it though. I can only really keep it in my bedroom. I have two windows, one West-Northwest and one North-Northeast. But I live in West Virginia and it gets pretty cold in the winter. Plus, our house has no central heating, so I use a little room heater. I’m worried that leaving my violet on the sill will make it too cold, but that moving it further from a window won’t give it enough light. I also read somewhere that African Violets need 8 hours of darkness to bloom. I’m wondering if my computer light will keep it from blooming, because I often stay up rather late. Right now, my violet has 9 leaves, including some really tiny ones in the center; 4 or 5 of those leaves are fairly large, and 3 of them have stems about 3 inches long. They’re a little lighter than crayola green on top, and a greenish pink on the bottom. It hasn’t bloomed yet, but it wasn’t blooming when I got it and I don’t know how old it is. It’s has a little tag that says it’s an “Edge of Darkness (standard)-hyb.” if that means anything to you. Thank you for any advice you can give! I’m really looking forward to figuring out how to make my little flower bloom! What am I doing wrong. Some of my leaves have brown spots on them. I am careful watering them. I always water from the bottom. OMG….I never knew all this about African violets. My grandmother grew them when I was a child but never shared her wisdom with me about their care or propagation. I have a lovely potted African violet but couldn’t get it to flower. Thanks to your advice I am hoping to not only get mine to flower but also produce babies. I will send pictures when I do. thank you thank you thank you for your help. I have had very good luck with African violets on a much smaller scale. I have used some of your method and will incorporate additional tips. Hi kevin, thank’s for info about AV this is really a good and great idea, I really like AV but its hard for me to maintain it,now I heard all the information and I used all of this. thank you again. Phosphorus is not good for the ocean. If I remember right it contributes to algae growth and algae robs the ocean of oxygen. Having said that I have one plant besides my Christmas tree that needs to be planted. Anyway I just misted it and introduced it to our youngest feline Jewel who is very smart. If she stops knocking it off the cabinet the African violets long term.survival chances incresse. I also gave the plant a modified pep talk and sang it one line of the Hallelujah chorus. I purchased an African violet from Lowe’s about a month ago. I immediately repotted the plant in a four inch pot with miracle grow potting mix, vermiculite and perlite. I put a miracle grow fertilizer stick in the soil. It is sitting on a pebble tray with water (does not touch the water) to give it humidity and it is sitting under a grow light right now as my windows are not getting enough sun (winter time). I keep it under the grow light around 15 hours per day. It is getting enough water and I do not overwater at all. I have a flower garden outside with perennials and a rose bush and they flourish!! So, the blooms all died. The leaves are mostly green and they are growing. One leaf has a brown tip. I removed the dead flowers from the plant. It seems I am giving this plant everything it needs so why is it not flowering and why the brown on the leaf? I am at my wits end and I hope you can help you. Your flowers are so pretty. Tried some of the other links pertaining to gardening at 10:00 am on 2/8/2015. I received 505 Server error on numerous links. Felt you need to know these kinds of issues. I believe it’ could be either with the Cloud you have or the server were the links reside. Hope you resolve as I love reading all your articles. Thank you, Kevin, for all of the very helpful info and for sharing photos of your beautiful flowering African violets. I’ve had my most recent African violet for about 4 months and have not had a single bloom; For starters, I’m changing windows today. (I had it in a subdued sunlight.) Next, I’m going to move it from a plastic pot that looks like clay to a real clay pot and I think I’ll try the pebbles, too. Thanks again! About 25 years ago a co-worker had a let me take home an African violet left from the table decorations she’d used for her wedding reception. It hadn’t bloomed since her wedding.I gave it back to her in a few weeks when it started blooming, but not before I’d helped myself to one of the leaves. I’m still sprouting babies from the plant that leaf produced. I get a kick out of the flower variation…white to dark purple and many combinations between. Mine are in the window above the kitchen sink, north window,florescent light over night. My violets haven’t had a bloom in a good few months (3-4) but new leaves have started to sprout, will there be flowers soon? Is there such fragrant African violets ? im fairly new to African violets and orchids but am quickly becoming a fan. The few African violets I have are doing wonderfully they’re all healthy and blooming beautifully and their leaves are facing downwards. All except one plant’s leaves. It is as healthy as the other violets and has healthy buds about to bloom but its leaves face up and are bouncy looking. (I think they look cute. )Are some African violet leaves just meant to face upwards? I have an african violet it is so big… it is growing out of the pot and it blooms constantly.. now it seems I’ve got smaller plants that have started growing in the pot and they are blooming also.. I’m almost afraid to take it out and disrupt it… for some reason I can really grow these plants so well I guess they like me lol. Any suggestions on what I should do… am I able to take the smaller plants out of the pot? Where do you find the suckers on the plant? Since I am ageing I am finding outdoor gardening not so easy. I am an experienced AV grower although I haven’t had it as a hobby since my younger days. Since searching on line where to order violets I came across your site & your window garden is beautiful. In the past I grew violets on a tension pole at a east window filtered with a sheer curtain. Now I have double hung windows & not sure how I could create that look. Also have always been afraid to order plants. We get them locally now & then. I recently purchased a dbl. pink & am growing it on a sun porch with roll-up blinds. I have tried to grow these but the never seem to flower or grow. when i get a new baby leaf there’s another leaf dying. i will try the propagate in a pot and a packet idea. My mum and I love love these flowers. But miss them as they keep dying and we have lost so many beautiful types of flowers this way. I don’t have space for a light. Do you think putting the plant in the bathroom during winter will be a good idea? the plant i have- the leaves are not getting firm / bigger, Any advice??? Your site is great and has tons of good information. This summer I kind of caught the bug and find myself in the plant store searching out interesting African Violets on a regular basis. I’m still trying to find what works for me. One of the conditions I’m seeing on my plants after a time is browning on the outer edges of some of the leaves. I’ve grouped the plants together so I’m going to give the pebble filled tray method a try. Wish me luck. 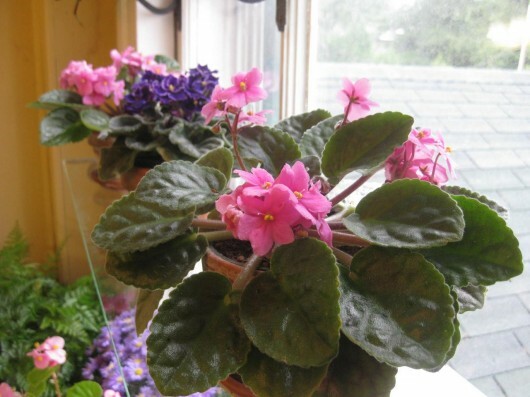 Hi – I’ve had violets for years, moved them to different homes, different rooms and have always had constant blooms. Last Spring we had new windows put in several rooms including the the “perfect” violet room that block much of the heat and UV light coming in. Great for the warmth of the house and our heating bills but my violets have not bloomed since 🙁 Have you heard of this before? I have an African violet that was my moms, we she passed away suddenly in February I brought it home. I don’t have a green thumb like she did and I am struggling to keep it alive. It did fine at first but now I feel like the leaves just keep dying. Any suggestions. It’s getting smaller and smaller…. Two days in a row my sun porch has reached 95 degrees. Felt sorry for my 3 violets so brought them inside in 74 degree temps. My ? is this: Will light from a regular 3-way lamp benefit them any? As yet I do not have any way to get them closer to an east window. When the porch cools down they will go back & be near a west window. Kevin, I’ve had a healthy AV for years. Over time, it has developed a “stalk” which grows up out of the soil and which only recently began sprouting leaves. Not sure how to handle this — should I cut the major plant away and transplant it to another clay pot? Any suggestions would be appreciated. Thanks! However , the sunlight does come through! And 82 at night . I also read that epson salts is good for them so they got that too ! to water from the top and they died on me. Now they are nice. Oh sorry Kevin I just left you a note asking you which pot you prefer or recommend for for African violets and just read what you said about preferring. Clay pots for them. So that question has been answered. Now I need to get 3 more 1/4″ glass shelves as I got 1/4″ ones the first time . Thank you for all your input on every thing it is such a help. Thanks for writing this post! I came across it on Pinterest, and I’m very glad it’s still out there after a few years. I have a house full of gorgeous houseplants including one finicky little African violet. It bloomed beautifully for the first few months that I had it and now, three years later, it has luscious beautiful foliage, receives the royal treatment for sun exposure, rotation, and humidity and has never bloomed again a single time! This post makes me even more determined to get that little baby to flower! Love your posts on African Violets, just would like to see more posts! I do like your other posts as well. With everything going the way of LED lights (yes even shop lights) Have you heard or tried growing violets under LED in place of Flourescents ? Do you think these would work? The consume less power, but is the quality and type of light as beneficial for violets. I used to grow violets under light like you do probably 20 years ago, I love Phaelenopsis orchids but just find them too finicky in my lighting situation along with bud blast etc. I believe I will be better satisfied going back to violets. Anxious to hear your thoughts on the LED vs Florescent bulbs. before I take the plunge. Hi Mitchell Webster – Many growers have reported that LED lights are terrific for African violets. I’ve yet to try them! I need help, I have an African Violet, that have long necks , I repotted it , but it is really looking droopy. Can you help me please, thank you. I was wandering if I could give them some super thrive??? My African violets were blooming and beautiful-then suddenly (or so it seemed) the became droopy looking and are no longer blooming. WI didn’t change anything so I am confused. I love your web site. It’s such a treat to come to it and see all the amazing things that you do. 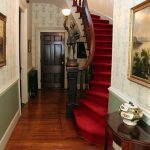 I love seeing the grand old homes restored such as you have done, it’s gorgeous. Hi Kevin- I just now, after growing and loving African violets for years, have just now found your website! I went crazy and have purchased A LOT of 2 inch plants over the past 6 months but they just don’t seem to be thriving. Mainly what I am getting for my efforts is tight centers and plants that aren’t growing as should be expected. . I thought my window was too hot so I recently set up lights. Before, I always used clay pots but have seen so many recommendations that I have began using plastic pots since I started with the new plants. I am also trying to not over-water but it seems like every time I water as recommended I start to lost plants. HI there. Can anyone tell me how best to keep my African Violet’s hydrated whilst I am on vacation, for about 2 and a half weeks? Any other options besides wick watering? Your article here is excellent. I grew so many using exactly the same techniques (Florida) and always had plants to gift to people. They had problems blooming but I never did. I think the plants are social and need each other to be happy. In the seventies, an inside garden was popular and some genius marketed a giant globe on at pedestal (very James Bond like) and the top half was clear with only a dinner plate hole cut in top with a pinwheel like device that allowed you to open or shut the “vents”. It held almost 10 plants and was an amazing sight when I took it out. Made of white plastic I could move it from the south window (in the winter) to the living room for max impact. WISH someone would sell them again! No one believed me that I gave them all a shower each week. They told me water would spot the leaves but it never did. I only used clay pots. All your tips are just perfect. I also grew a lot of babies the same and began visiting the “violet house” and paid for a plant but only took a leaf from 10 plants – after getting the OK from the owner. That way I kept getting more to feed my addiction. Another plant that propagates the same with many even bolder colors is one many people get while in the hospital-Gloxinia. I thought mine had died and left it in the storage room for months then came back in the spring to find it sprouting and found a new love. Propagates the same and I got so many different kinds by paying for a plant and taking only a leaf from 10 plants again. The only drawback is they go dormant but this isn’t bad enough not to grow these gorgous large flowered plants. Thanks for your great articles – always. I have east facing windows, a garden window and 2 sets of sliders. I enjoy many AVs and some orchids and most of them thrive, winter & summer. I have 2 AVs which are probably 3 yrs old each. One has beautifully ruffled leaves. Both do not bloom. I feed them weekly. Should I try the surgery you recommend? I just repotted them in November. Thanks for sharing such valuable info. Every thing is so easy when you have a great instructor 🙂 well, I bought my african violets one year ago and they were doing very well but recently I have noticed some changes on their leaves. It seems that some leaves got hairy and a bit curly. there is no brown and yellow spot and they keep blooming. their growth has not been slow and in fact they have lots of new leaves on their crown. however, the number of buds is less than what it already was. Also, there is a white powder on some flowers but i found no other change on the flower. I am wondering if you advise me whether they are in normal condition or they’ve got some problem. I just purchased an orchid. While trying to find out how to care for verses a violet I can upon your site. Years ago I had a violet that never flowered. I was told it wasn’t in the right window. When living in NC I found the right window. I had flowers year round. Moved to Il. and lived with my daughter. I brought 16 plants with me. Slowly they died off. Moved to my own house and brought the last three survivors with me. Now they are back to flowering year round. I was told they love to be crowded. My one plant got so big I decided to thin it out. I ended up with 8 little pots and one a little bigger for my original pot. It took time for the shock to wear off (a month) but is flowering all the time again. I have a gallon of water from the sink that sits for the week, I add 40 drops of the liquid violet food ( from Walmart) I water all my plants with this water then replace water/fertilizer as needed for the next week. Works great for any leaves I want to root. My plants Lokal so beautiful with all lol the flowers on each plant. I’ve never gone to this much trouble and mine have had continuous bloom for four years now! I received two pitiful, near-dead AVs from my neighbor in the summer of 2011. One of the plants was actually 3 plants all trying to live in one pot; I separated them into 3 pots, plus the other single plant stayed in its pot, for a total of four AVs. I potted them all in small (3-4 inch) glazed ceramic pots, in a mixture of about 75% plain old miracle gro potting soil and about 25% plain sand from our back yard (we live in north Florida and our back yard is sandy loam). I always use this mixture for all my potted plants, and they thrive in it. I placed them all in my east-facing kitchen windowsill. I water them once a week, using warm water gently streamed in from the kitchen faucet (a very slow stream), except every other week I use a mixture of water and AV fertilizer per the label instructions (I make it up about 50% stronger than the label instructs). When the fertilizer water pools in the pot bottom, I leave it–only if I notice there’s still some standing water later on that night or in the morning do I dump any excess. I never pay attention to temperature; the temperature in our home varies from 78-80-ish in the summer to pretty chilly in the winter…we run our heat very low, usually around 62 and we’ve had many sub-freezing nights, yet I’ve never moved them from their spot in their east facing window. Same with sun exposure; we’re in Florida and I’ve never shielded them from sun in the summer (then again, they only get morning sun in the summer due to being in the east facing window). I just leave them in their spot year-round and they love it. About 6 months after saving them from my neighbor and re-potting them, they began blooming in Feb. 2012 and haven’t stopped since. Apparently my potting soil/sand mixture, once a week watering/biweekly fertilizing, and constant east-facing window placement is exactly what my AVs love in order to give me constant flowering. I don’t think it has to be so complicated, from my experience. I have two different kinds: one is deep pink and the other 3 (which came from the same single plant, remember) are dark purple. I read in an earlier comment that rain soft water isn’t good for AV’s. If I cannot catch water that doesn’t go through the water softener would distilled or purified water be better? 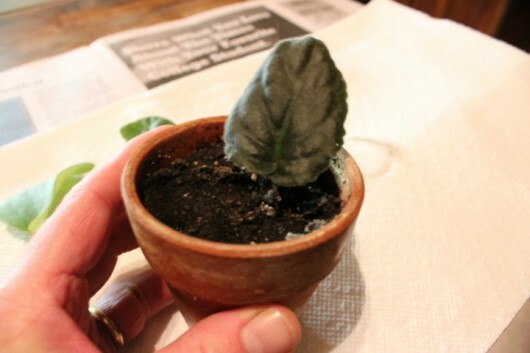 I saw the picture of progating a African violet leaf of one inch and put in the pot and how does it get watered it when new like that?do I water from the bottom like I would do to a patent African violet?and putting new leaf in a pot is that starting a fresh African violet? Hi Kevin, I love checking out all your info about violets. When you talk about “weekly shower”, do you use a spray bottle. I’m hesitant about water on leaves and ruining my plant. BUT i will try it. Also what do you think about self watering containers. I have been told that violets won’t grow if you have propane heat. Is this true? Hi Elaine – My music room is heated with propane. African violets (and other plants, too) grow perfectly well there. End of story! Hi Kevin! thanks for the newsletter! 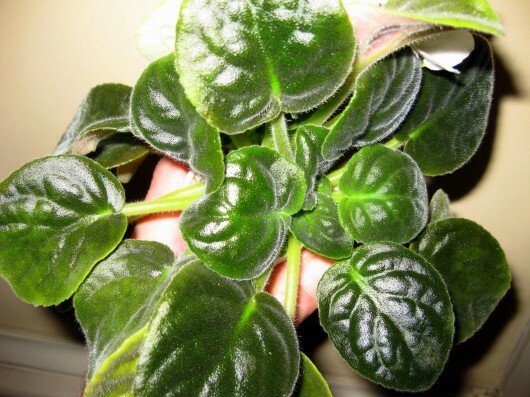 I just bought an AV from the local garden store and since we don’t have the kind of luxury of imported african violet varieties and equipment, it’s been a little harder. It’s tropical where i live. it’s always around 90% humidity, even in air conditioned rooms. I have brought my AVs inside and i put them inside clay pots as plastic tends to rot african violet roots here. I had one about a year ago and it did quite well. It started off as pink and then the next time it bloomed, it was purple. Right now i have two new violets and I need your help because this seems like a very personal problem. I keep them in my room which has air conditioning. I saw that when I put them in a different location, the leaves were pointing upwards and now they are settling back down. I have fear that the air conditioning will damage them? it’s around 23-25 degrees (celcius) in the daytime and I set my air conditioning to 20 degrees each night. Do you think that they will survive? My grandmother used to grow these but she lived in more mountainous conditions, never needing air conditioner. When I bought it, I changed the medium directly and downsized the pot. I removed all the visible blooms to avoid to much repotting stress and right now it’s beside me, (hopefully) doing well. I hope you see this because I feel like this is kind of a unique situation. Hi James – Temperatures in the 23-25°C range are ideal for African violets. Just make sure the air conditioner isn’t drying out the room too much. The plants need at least 40% humidity in order to thrive. All best to you! hi Kevin, Thanks for replying. There are two visible flower shoots coming out of the base and it’s been a week since they appeared. they haven’t swelled or extended. i’ve been checking them daily and i think it might be the stress. I can be patient if it’s the best for the plants. I forgot to tell you that I can only give them a south facing window. anywhere else in this house is too shady or will fry the plant. we get quite bright indirect sunlight and if I sucseed in this, I’m going to litter my room with african violets. Have you ever known that they call it Violces here in Indonesia? Thanks Kevin helped me alot with your info these are my favourite flowering house plants just started doing my own cuttings here’s hoping they come out ok.
Hi, I was just wondering if you recommended I pluck dead, brown flowers from the plant or leave them as is? Also, my grandmother has been asking me for a different colored African violet (I gave her a dark purple one a year ago and she has created at least 35 new ones). Do you recommend any stores/online stores? Thanks! Hi Jane – Over the years I’ve purchased a great number of African violets from Lyndon Lyon Greenhouses. Outstanding plants in colors you would not believe. They ship! Here’s the website: Lyndon Lyon Greenhouses. 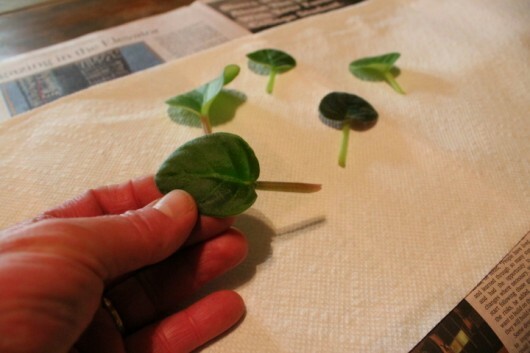 Hi Regina – The small, compact leaves on your violets are probably new plants, or “suckers.” You can cut them out and pot them up as described in this post: How to Divide and De-Sucker African Violets. Hi Kevin. Thanks for your quick response. 🙂 I’m pretty sure it’s not a sucker. The whole entire plant’s leaves are like this. The leaves are only growing out of one center, if that makes sense. Is there anywhere I can send you a photo to look at? Hi Regina – Are the leaves tightly compacted and hard to the touch? To send photo, hover your mouse over “Ask Kevin” at top of this page, and then click “Email Kevin.” You can attach picture to the email. I’m practically new at this and would love to learn more. When you set your cuttings in a humid environment (plastic bag) how often do you have to water it and when do you take off for good the plastic bag? Hi Silvia – When sealed in a plastic bag or covered in a plastic “terrarium”, the rooting AV leaves won’t require water for at least a month. Mine never do. To introduce plantlets to the natural humidity of your home — and there’s no hurry here — open the bag or terrarium gradually over the course of a week. I hope I’ve answered your questions! Thanks for the quick respond. So after 1 month I open the plastic container and if it needs to be there more time, spray some water and close it again? Sorry, just trying to understand how it works. Hi Silvia -Yes, if the soil needs water, add it. Have fun with your project! Would you allow me to use one of your lovely photos of African violets in a window for an AVSA email? I would include your photo credit and a link to this page. Hi Joyce – Yes, anything for AVSA. And by the way, I still have the handwritten letter you sent back on April 20, 2009. The letter informed me that I had won an award from AVSA for an article on window gardens. I was thrilled to receive the news! Thank you Kevin! I appreciate your help. 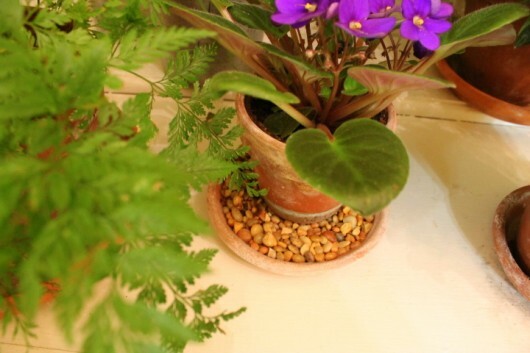 I plan to use the lovely one of the violets in clay pots sitting on a sill. You will get credit and your website will be accessible from the email. I’m working ahead on this, but anticipate that the email on window growing will go out in early June. If you haven’t already signed up for it, go to http://www.avsa.org and look for the sign-up invitation right under the Join Now button on the home page. Great website! Okay Joyce – signing up now! There is no mention of root hormone. Do you not like using it? Is it better for some and not others? Hi Zoya – Rooting hormone isn’t necessary for AVs. The stems root just fine without it. when do African violets get old & you have to throw them out? Thanks for all the excellant tips! I propagated a leaf (the ‘mother’ was purple/white striped) and it is blooming, but it has a burgandy flower…how can this be?! Also my one AV’s main stem (is it the neck?) was about 2” and the leaves were getting small,. Would appreciate tips!! I am looking for an African Violent called Shady Lady. It was a light purple with white spots. I had an African violet bloom just sitting on my couch side table! I don’t know how or why, but I love that it bloomed and makes me want to try for more! Thanks for the guide! I have 3 African Violet’s that I started from cuttings. The problem I’m having with one is it’s growing a long curving neck while my others are flourishing. The one with the long curving neck is spindly, wilty and no blooms while my other two plants are full, thick, and full of blooms. The only thing I can attribute it to is it was in a shallow 2″ self watering pot, while the other two are in deeper 4″ standard ceramic pots. Transplanting into a 4 inch pot didn’t produce any positive results. After researching, one site suggested cutting off the bottom of the root ball and replanting. The second suggestion was to cut the stem and root the leafy part in order to produce a new root system. I’m inclined to try the second. What do you recommend? If the second, how do you do this? I have never had any luck with African Violets but I saw one the other day and couldn’t resist it’s beauty. Thanks for the info on how to care for this lovely plant. Ellen, I put on my boots, went hunting for this one and I bagged it! This violet is called Crystal Ice. violet barn.com has it but they are sold out right now. Keep checking back or maybe they can email you when one becomes available. I just had to have one too! Thanks for sharing your AV knowledge with us! From the number of comments – you need to add more posts as I think we all love your information and beautiful pictures. I’m glad to hear that you give your plants a shower. I was told NO don’t ever but I gave my numerous African violets a bi-weekly shower in the tub. I just got the shower luke warm, and began loading the tub with my plants. After a nice shower, they stayed there until they dried – easy peasy and gorgeous, healthy leaves. I did propagate them until I had too many to care for. When I moved, I lost them all due to unexpected cold as I moved. It was a dreadful time and I haven’t had any since – 10 years is a long time to mourn. Your post makes me want to dig out some treasured clay pots and begin again. Nothing is like a host of colorful friends to visit at coffee time. I have 2 beautiful African Violets and love them. They are nice and full and just finished blossoming. One of them does have a side shoot, but it did flower so I am leaving it for now. I love the pots that I have them in. It is two pots in one. The top pot have the dirt and the plants and the bottom holds the water. I can get almost a quart of water in it and it keeps this inside (bisque/unglazed) pot moist. I never have to worry about watering them. I use a liquid AV food that I had 7 drops to the water. I wish I could add pictures to my comments…oh, well. I could never get them to bloom, but found they needed more light. I put them on a stand in front of the window and now they bloom constantly. Well Kevin, You give me hope! After reading your tutorial on growing African violets, I may try one more time. My dear neighbor potted up three of her plants and gave them to me about 6 months ago and I have all bug killed them. They are going fast. She put them in a big plastic pot but hers are growing everywhere and flourishing. I have mine on a cute flower cart where everything else is flourishing and they get the southern window light. She said not to get the leaves wet so once a month she said I water from the bottom until they drink no more so maybe I am giving them too much water. Their poor little leaves can’t lift their little heads and I hate to tell her I have killed her babies that she gave me to care for. So small clay pots and does it matter if it is potting mix or potting soil? I know I am not doing something right on these little guys. Thanks so much for your blog. Hi there! Love your blog. Perfectly stated,easy to understand and includes so much useful information! <3 My question is about my one and only African violet. Iv'e had it for a few years now. Unfortunately, I just read your blog for the first time and Ive never known to turn the pot. Now my African violet is kind of grown out and its hanging over the side of the pot. The stem is become very long and I'm afraid to do anything because I don't want to kill it. They are so delicate! Do you know of any solution on how to bring it back to its former glory? Thanks! I have to take exception to your advice that almost any potting soil will do. Many new potting soils contain slow release fertilizer. The addition of this urea based fertilizer does two things that are unwelcome. First the urea causes root damage to African Violets and second it interferes with the normal fertilizer routine. The double dose of fertilizer on newly potted plants will often show effects as damaged, stunted new leaves with orange crystals on their surface. I mix my own potting soil because it is getting increasingly difficult to find soil without the fertilizer already in it. It isn’t difficult or expensive, equal parts of sphagnum peat, perlite and vermiculite. Thank you Kevin. I am currently growing quite a few varieties in the bathroom at the moment . I was concerned about some older plants I had which haven’t been re-potted for #### years. I was wondering how safe it would be to tease out the newer shoots and having read your article I am keen to start hacking away. I do not water mine from the top as this seems to make my plants die, the leaves just turn to jelly and rot. It might be the different climate.Thanks again. Thank you so much for the instructions ! i love African violets and i have some in my home but i find very difficult how to propagate soon. some are faster than before. some never give babies but looks still alive why? what to do with those kind of planted leaf? I just went into the living room where my violets are and noticed that one of my mature ones had been knocked to the floor, lost 1/3 of its leaves and then put back on the table. I have taken the broken leaves and started them rooting as you suggest. I am concerned about the shock to the remaining plant. One side of it is completely leafless :>(( Should I leave the remaining leaf stumps or remove them? I don’t want to cause it anymore shock. Does it require any special care? These questions seem a bit silly to me, but knowing the answers would be helpful. Thank you for any help! Hi Betsy – Your plant should recover. It will look a little “wonky,” but it will recover. Where do you get your fluorescent lights?? My African violet to bloom has lot of sunlight growing big but no flowers do I need to get pebbles as suggested and give warm water and plant food. Need help. I grow my violets under lights. They do wonderful. One plant leaves are growing smaller and smaller is this a bug problem? I bough some AV online and as you mentioned they came in tiny pots. With my back then lack if knowledge, I immediately repoted them in much larger self watering pots. It’s been 7 months now and of course no flowers yet, just beautiful foliage. Is it worth waiting a couple if more months or should I just repot them to smaller pots? Hi Jose – I would not downsize pots at this point. Your violets will bloom when their roots have filled their new (oversize) pots. Just give them the care that I described above. Any suggestions if I do not have an east window in my house? I have mine in a south window now and it is mid-February. Thanks. You sure brighten my mornings! 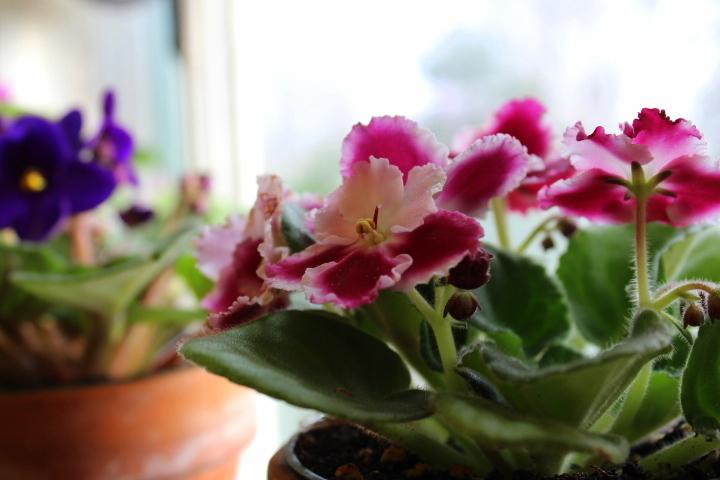 I love your violets….I have 8 plants I think 2 are needing surgery. I live in central Florida and find the east window is best. It is always fairly humid here…we just enclosed our lanai with low E windows and I wanted to move them out there on a beautiful bakers rack. Is this wise? I tried to find an answer in the above, but there were too many emails to read. Wow! Anyway, I tried planting the leaves from one that wasn’t doing well and I have 6 baby plants now! One has bloomed and another has one coming. I forgot to separate the ‘mother’ from the plants. So I will when I change from plastic to my new small clay pots. Can I replant the ‘mother’ again or should I think she’s tired and needs to go to sleep? This is so much fun. My babies are all named! “George” is the biggest and bloomed first. Thanks for your site. It is calming, beautiful, restful and inspiring in a day and age of anger, frustration and violence. Thanks!! I am so glad you re-ran this Kevin! I bought a vintage plant stand with lights a few years back, and decided recently this would be the year I devote it to plants instead of seedlings…African Violets to be specific. Thanks so much! Grandmother had a huge east window over her very large and very-long-with-drainboards white enamel kitchen sink. You can imagine the extent of her African Violet propogation and collection; they overflowed onto most of her kitchen table! What memories of walking into her kitchen filled with those gorgeous gems of colors. My job was to carefully water each plant with the oh-so-slender spout of a silver watering can which I use to this day. I will say though that she propogated (and now I do too) leaves by simply sticking them into a vase of water and then potting in dirt when rooted. I have an AV that has grown about an inch above soil level. Should I plant it deeper to cover the stem? I wish I could post s photo of it. I cut a large sucker off and am wondering if more suckers will grow from the stem. I love African violets.I received my first one from my aunt Hazel yrs and yrs ago .She is gone now but the little miniature violet she gave me lives on.It instilled a passion in my like no other I had ever had. I have shared many plants over the yrs .Even though a few different plants have entered my house my violets are my favorite.I never seem to have trouble with blooms and cant resist pictures every now and then to share on fb.they are addictive. i was given an african violet as a gift. it was in bloom when i received it but the flowers died away, along with a bunch of leaves. i put it in a smaller clay pot because i knew the big plastic pot it came in was too big for it. i also bought african violet soil for it. i’ve had it for a year now and tiny leaves are always growing but the bigger leaves are always dying, so overall it’s not growing much. what i have now is like a new baby plant. after reading many articles on african violets i see the consensus is the pot should be 1/3 of the diameter of the plant. so i changed pots again today, putting the plant in my smallest pot and it’s probably still too big. my plant is 4-41/2″ across with very small leaves. my pot is 4″ across the top but 2″ across the bottom. that makes the bottom part of my pot okay but it makes the top too big. how do i know what the right size is when the top and bottom halves are so different? also, how deep should the pot be? thanks. I love African Violets. My mom and Grandmother had them. Mine are all wilted on one plant and the other plants leaves die from the outside of the leaf and progress inward. They look awful. Help. Thank you for sharing these useful tips. I recently was passed down an African violet that was my great grandmother’s. She has been gone a little over 20 yrs. My grandmother has maintained most of her flowers and passing them on to different generations. My great grandmother’s windows looked a lot like yours. I remember 4 big windows filled with violets from top to bottom. I was so nervous about killing the flower. It has bloomed since receiving it. However it does have a vine of leaves coming out the side and down the pot. Should I break those off and start new plants? I don’t want to kill it by doing so. i love violets, and i’ve had some for over a year but they wont bloom. can you tell me please what i can use for them to bloom? it would be appreciated. thank you! First off let me say what a beautiful collection you have, so so many and they all look so happy! I was given a Violet about a year. I put it next to big east facing windows so they have been getting early morning sun for about an hour or two, then it’s shaded but still receives a nice bright source of light for the whole day. I was guessing when I first placed it there but man oh man! It has NOT stopped blooming since I put it there. Also, a whole new violet popped up and quickly took over half the pot so I split them apart. 3-4 months later both pots created a baby plant so now I have 4. Already I feel like I need to split these guys up again cause I can see new fuzzballs trying to unfurl (my greatest joy of growing these). I wish I could show you but the leaves in the middle where they touch are starting to really collide somewhat? The leaf stems don’t seem to be hurting each other but I’m wondering if its time to let them have their own space? Thank you! I had a plant that was given to me and I kept it alive for two years. I was watering it and feeding it once a week as I read water every seven days and feed with seven drops of food each time water it! Ok, all was going great! Then I decided to see if I could propagate another plant so I put a leaf in water and it rooted! All is great still! Then I read don’t fertilize in winter so it was winter so I stopped and then the first one died with in two weeks!!! Now, the one I propagated is still doing good but it hasn’t bloomed? [After the first one died I went back to feeding this one each time I water it, every 7 days, seven drops]! I’ve tried the terrarium route twice but the leaf just dies. Currently I have it in a south window so guess I best be for moving it since we coming into summer! I am in awe of your beautiful violets! I can tell how much you love them. I’ve been trying for over a year to get mine to bloom and nada. I had repotted each one and inserted a string, and sat them on top of a container of water with fertilizer. It has been a major disappointment. So, just today, I went back to watering them from the bottom for 30 minutes and have high hopes that they might start blooming. They sit next to an eastern exposed window under a gro light. I’ve tried several spots with no success. I’m hoping that my new regimen will do the trick. I have some plants at work that do beautifully under fluorescent lights. Good afternoon… I hope your day is going well. I sent you an email several weeks or a month ago and never got a response? Maybe I did something incorrectly in trying to submit ? My question is …since I moved up North my continuous blooming African Violets do not want to bloom anymore …and I have also purchased new ones from a huge grower in upstate NY..so now I am thinking are these going to bloom again ? They are all on a table in bright light…and before I moved here I actually lived in a basement apartment that had numerous windows that received direct sunlight at various times of the day and they bloomed non stop it seemed..
Hi Diane – Give your African violets the “blossom booster” food I described in the article above. If all other cultural conditions (light, humidity, etc.) are satisfactory, your plants should reward your efforts by forming flower buds in 2 or 3 weeks time. Hi Carol – Warms my heart to know this article was helpful to you. Kudos to you and your plant! I never had any luck with them until last year when a friend gave me one as a thank yku gift. She purchased it from our lival Ingles Grocery store. I set in my bathroom window. I occasionally stuck one if those fergilizer sticks in it. It is amazing. I have transplanted it twice to larger containers. I have no clue what I am doing right but I am thrilled with it. Hi Diane – Sorry for the delay in answering your question. Limp or wilted leaves indicate root rot. Root rot occurs when soil is saturated (avoid overwatering!) or when soil mealy bugs have infested the plant. Knock the plant from its pot, and if you see streaks of white around the rootball, you’ll know that soil mealy bugs are present. You can leap through hoops to get rid of these dreadful insects, but the easiest solution is to ditch the plant. Hi! So my boyfriend just gave me a violet plant, and I was researching how to care for them since I’ve never been good at keeping things alive. I am glad I found your site because honestly I love plants so much, I’m just horrible at knowing how to care for things. Hopefully I can keep it alive and soon create a beautiful set up like yours. I just love flowers so much and to have an indoor garden full of them would be amazing . Thank you for this information!!! Thank you so much Kevin for getting back to me… I now have 2 African violets with limpy leaves and they were brand new purchases through an African Violet Wholesaler that I go to when I want new plants…that is disturbing…I will do what you suggested and if I have to dump the plants maybe I can take some leaves to root? Thoughts on leaf cuttings from these 2 plants? Thank you again and have a Blessed Thanksgiving…. Thank you for the useful info. I had several plants that didn’t thrive but I will try it again. You have great info on care of those beautiful plants. My SIL had a gorgeous plant and she did was cuss at it. How do I get rid of white “fuzzy stuff” on leaves and stems? Great tips! I have one African Violet my friend gave me that seems to be in constant bloom. It resides in my master bath which gets lots of sunlight and some humidity form the shower. I water it weekly and it does very well. All my plants in my master bath do well. I should turn it into a greenhouse! Lol! I’m going to try to propagate this plant as you discuss in this post. This is the best site I have ever seen for African Violets. I have had mine for years and they bloom constantly. I recently bought a light blue one, very pretty….however, the new buds growing underneath are all dried out. I have already started a new plant with one of its leaves. My African violets are on a windowsill above the sink in my kitchen and get quite a lot of moisture and plenty of light. I just don’t know what the problem is and how to solve it. Thanks in advance for any additional advice. Thank you for this article. My african violet has stopped flowering and I didn’t know why. Now I know it’s because a lot of suckers has appeared at the sides. Looks like I have to cut them out. Thank you for sharing these tips. Following your guidance, I had recently ‘operated’ on the suckers attached to 2 of my plants which had stopped flowering. Now one pot has started flowering again. And I’m getting many tiny babies from the leaf cuttings. Kevin, I always feed my violets with dechlorinated water. I fill a jug and let it stand 24 hrs so the chlorine can escape. I feel that plants do not like chlorinated water. Do you agree? Also, is it a good idea to propogate during the monsoon season? it’s the monsoon season here in India now. If not, when is the best time to do so? I love my African violet!!! It has always bloomed beautifully for me, but was purple when I first got it and has had white blooms since. I’m not complaining though….. It always has flowers. I noticed today though, that the edge of one of the flowers is purple. How did I do that? I plan on propogating some babies from her now that I’ve read your article and know how. She’s a beauty and I would love to share her with family and friends. Thank you so much for all of the info. God bless! My white saintpaulia are turning brown , I bought hem couple of weeks back but since then the flowers are brown even before they bloom. Not sure what am I doing wrong? I have really enjoyed your AV information! Thanks to you, I have put my 2 violets under lights about 6 weeks ago and changed to the food you recommend. My white violet is getting ready to bloom but the purple and white violet is not. It’s very healthy with lots of new leaves, just no flowers. Please advise. Does stressing an African Violet, like hitting the pot or re-potting the plant, make it produce more flowers? I have African violet that the stems keep growing long instead of filling out. I mean like real long. Leaves are healthy and blooms a little. Have several violets and this only one that does this. Any suggestions? My grandmother grew beautiful African violets in a north facing window. I can’t tell you how many she passed on to me. I killed them all. Maybe I should try again, with good instructions from you. Kevin, you have inspired me to get an AV. I have never grown them before. I have a south facing window over my sink that gets lots of light. I hope it will be enough for the AV. I love your multi colored ones. I like growing things that are unusual, not what everybody else is growing. Thanks for all you very informative information. I love your blog. Kevin- I have become my grandmother! I currently have started 13 pups. Can AV’s withstand shaded bright light and 90* temps? I live in south Fla. but they would only get covered bright light. Also, can the new LED overhead fixtures be used instead of the florescent fixtures, or are the light rays different? Thanks for all your tips and pics! Your plants are stupendous. You have a gift. Your passion blooms! 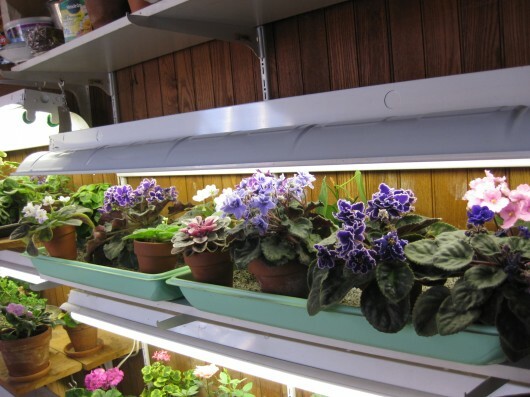 Hi Margo P – Based reports I’ve read, African violets do very well under LED lighting. Hi Diane – I’ve visited Lyndon Lyon Greenhouses many times. In winter, the place looks like the Garden of Eden! There is an African Violet that I take care of in my office. I have re-potted this plant 3 times & it is always has pink blooms & is beautiful. I just make sure it is watered & every once in a while I add plant spikes to it (which it loves)!